The mail arrived yesterday and a new/old friend returned – my quilt Polaris from the final round of the McCall’s Design Star Contest came back home. 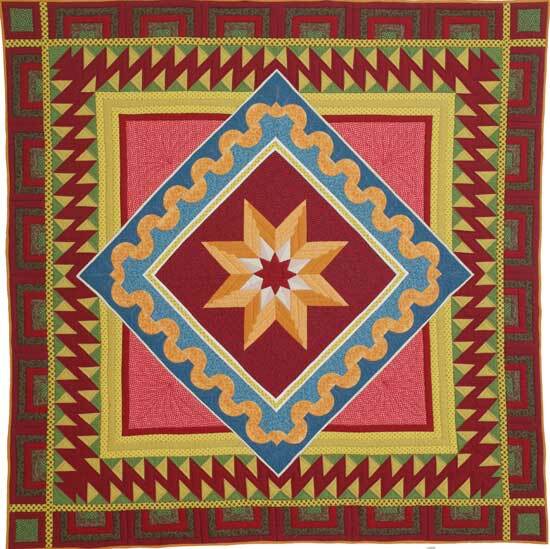 This quilt was made with Mary Koval’s line of fabric Baltimore Album from Windham Fabrics. 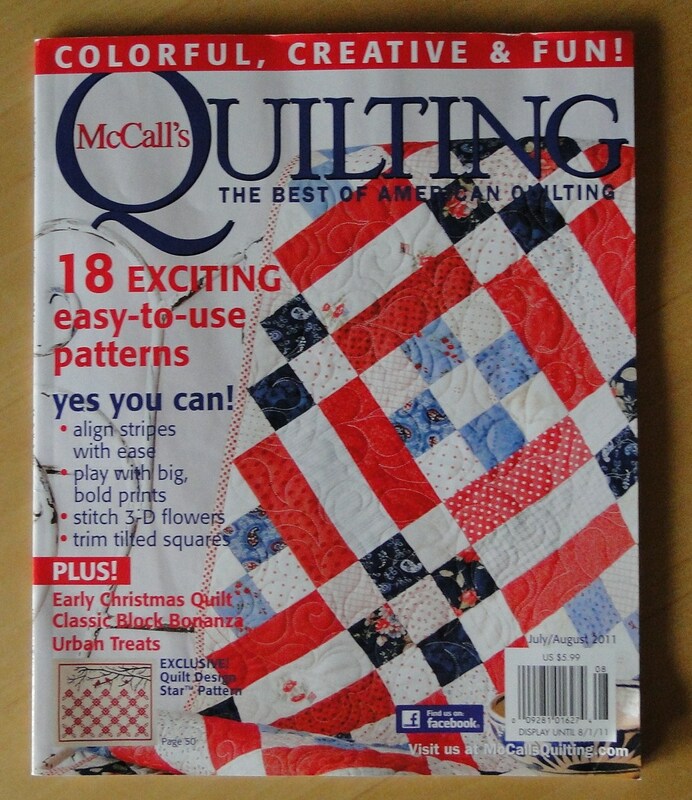 With it were copies of the July/August issue of McCall’s Quilting with an article about the 8 finalists. It is hard to believe that it was just over 10 months ago when I began the journey of jumping into the first design contest that McCall’s sponsored. 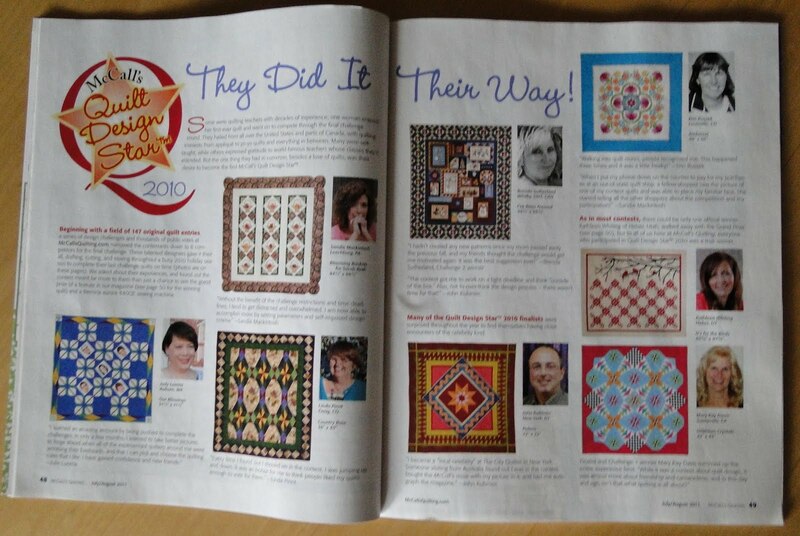 I always joked that there should be a version of Project Runway just for quilters and this seemed to fit the bill. So I looked through some of the quilts I had made, picked one and sent it off. And it seems that before I knew it I was taking part in the first challenge and then time flew and I found it was the end of December and I was sending off my final entr. So, what did I learn from taking part in this contest? Well…. “Nothing ventured, nothing gained” is a phrase that is often thrown around – and it’s true. What is the worse that could have happened – I get cut in the first round, maybe my pride would be hurt a bit – but hey give it a shot. Love your design wall – it is your friend. When you think you hit the proverbial “brick wall” – walk away (yes even for a whole day – maybe two) – do something different. Take a break. Come back with a fresh eye – it’s amazing what happens. Don’t limit yourself – be willing to think “outside the box”. I just dumped all sorts of ideas/concepts onto a sheet of paper – no matter how crazy or absurd. My first choice for a challenge wasn’t always what I ended up doing, but this list gave me options to come back to. Time constraints can be a very good thing. We didn’t have much time to play around – so it was come up with and idea and go for it. Sometimes I tend to “over think” things – here it was FOCUS – DECIDE – GO WITH IT. Limits can help you be more creative than you think. Granted they can be very frustrating, but it can also lead to new creative ideas. When I received a package of 10 fat quarters for the second challenge and had to use 8 of the 10 – I said ……. (you can fill in the blank with your own sentiments). So – how does this apply to you? Don’t be afraid to enter a contest or put a quilt in a show. The feedback from friends (old and new) and is a great thing. Take a class exploring something which is “not you” – you might learn to like it – maybe love it, but you won’t know if you don’t try. I bet that you come away with some new idea/trick you can apply to your own work – and you might even meet a new quilting friend. Challenge yourself – get some quilting friends together and challenge yourselves to create something – design your own challenge.